We’re always trying to innovate by offering more services to our passengers to make their vacation more enjoyable. Whether in cabin or in the checked baggage hold, we help transport animals in a safe, secure manner, thus providing passengers with greater peace of mind. Pets: Only domestic cats and dogs are accepted for carriage. All other animals are not accepted on Air Transat flights. Emotional support and certified service dogs: When accompanied by certification and documentation and travelling with a person with a disability, emotional support and certified service dogs are welcome in the passenger cabin of our aircraft. Please click here for further details. When travelling with your pet cat or dog, please reserve space for them at least 3 days prior to departure. This ensures that the maximum number of pets per aircraft has not been exceeded. Passengers who have not made advance arrangements may be denied carriage of their animal. In the event of a delay Air Transat will make every effort to return the animal to the responsible passenger. Each country has specific requirements for the acceptance of animals, including documentation, restrictions on breeds, and fees and conditions for acceptance. Please consult local authorities before departure. You must be at least 16 years of age to travel with an animal. You must bring a health certificate indicating your pet’s breed and proof of rabies vaccination. You must also bring any additional entry and agricultural documents required by the destination country. Only cats and dogs are allowed in the checked baggage hold. This service is not available on connecting or codeshare flights. Karabash Dog (Kangal/Anatolian Shepherd Dog). The animal must be shipped in a kennel one size larger than the normal standard. There must be ventilation openings on the four sides of the carrier. It is recommended that the pet be acclimatized to the carrier as long as possible before departure. You are solely responsible for your pet’s health. See the list of accepted brachycephalic dogs and cats Breeds. Should those conditions not be met, the pet's transport may be refused. The fees would be non refundable. To St. Lucia, to Republic of Ireland and to United Kingdom: Cats and dogs are accepted as cargo only on Air Transat flights – advance arrangements are required and additional fees apply. Certified service dogs and emotional support dogs are accepted on flights to London. Certified service dogs are accepted on flights to Manchester, Dublin and Glasgow. To Mexico: Strict regulations are in effect. Owners must hold specific health certificates issued within a certain time period prior to travel. Failure to present valid documents will result in the quarantine of the animal upon arrival and additional costs for veterinary inspection. Complete information can be found on the Servicio Nacional de Sanidad, Inocuidad y Calidad Agroalimentaria website (only in Spanish). To Portugal: Advance arrangements are mandatory for all cats & dogs (including service dogs) entering Portugal from outside the European Union. Click here Will open in a separate browser window for details. Larger cages must be shipped via Air Transat cargo and advance arrangements are required. Should your animal or cage exceed the maximum weight or size detailed below, please contact our cargo department for assistance. The animal must be in a cage approved for air transportation (IATA regulations) and bear the animal’s name. A plain rigid plastic cage is mandatory. Cages made of wire or any other material will not be accepted (a wire door is acceptable). All cage doors must be secured with a locking mechanism to prevent opening (see additional information below about supplemental strapping). Maximum weight accepted at check-in: 45kg (99 lbs) (including the carrier). Maximum carrier size accepted: to the South, USA and on flights within Canada: 81.3 x 122 x 84 cm / 32 x 48 x 33 in. (W x L x H) or to Europe and the UK: 122cm x 81.3cm x 89cm (48 in. x 32 in. x 35 in.) at check-in; larger cages must be shipped via Air Transat cargo and advance arrangements are required. The cage must provide sufficient space for the animal to stand up straight-legged, turn around, and lie down. For the comfort and safety of the animal, cages that do not comply with the requirements described above will be denied for transportation of the animal. A is the length of animal from nose to root of tail. B is the height from ground to elbow joint. A + 1/2 B = length of container. C is the width across musters. C x 2 = width of container. D is the height of container (top flat or arched)/height of animal in standing position. 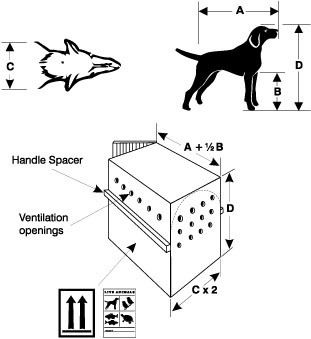 The length of the cage corresponds to the length of the animal from the muzzle to the length of the tail by adding half of the height from the ground to the elbow joint. The width of the cage should be twice the width of the shoulders. The height of the cage is calculated relative to the pet’s height when standing. Make sure the cage contains air vents and space bars. No animal under 12 weeks of age may travel alone. Exceptions: A female dog with puppies or a female cat with kittens between 6-12 weeks old, or, up to 3 puppies or kittens from the same litter between 12 weeks and 6 months. The cage must be large enough to accommodate all of the animals and meet the comfort requirements outlined above. For the safety for your animal, Air Transat may apply supplemental strapping to your animal’s cage (at no charge) which helps to ensure your dog or cat remains secure for the duration of their trip. Once you have exited the baggage hall at your destination, you will need a sharp instrument to cut the strapping from the cage. Please note that security restrictions prevent our ground personnel from providing this tool for you. We recommend the cutting tool be packed in your checked baggage as it won’t be permitted as carry-on or through any security checkpoint. Rates and charges shown apply only to animals checked into the cargo hold. Service animals on duty in the passenger cabin fly free. At airports outside of Canada, actual amounts may vary and will be charged in the currency used in the departure airport. To and from Europe: CAD $275 each way per animal. To and from South/U.S. : CAD $150 each way per animal. Our fees are payable at the time you make the reservation for your animal(s). Upon entry into Canada: A CAD $30 fee (plus tax, per animal) will be required for inspection by Agriculture Canada. Arrivals from the U.S. are exempt. *Cargo rates differ from the rates above. Upon payment of the charges associated with the reservation for your animal, Air Transat will reserve a space on the flight(s) selected. Passengers must notify Air Transat of any changes to their itinerary. Changes to the travel itinerary of the animal are accepted up to 3 days prior to departure without any penalty. Cancellations to the travel itinerary of your animal are accepted up to 30 days prior to departure. In the event of cancellation as provided in the present clause, Air Transat’s liability is limited to refunding the charges incurred for this service only. Only cats and dogs are allowed in the cabin. Only one animal per passenger is allowed. It is therefore strongly recommended that passengers book this service in advance. Passengers are not entitled to a carry-on item in addition to the pet in the cabin. The animal carrier counts as a carry-on item. The total weight of the carrier and animal must not exceed 10 kilos. A passenger with a pet in the cabin cannot occupy a seat in Club Class, or the emergency exit or bulkhead seats. In addition, unaccompanied minors and passengers travelling with medical equipment cannot bring an animal in the cabin. In the case of allergies, there must be a minimum of 5 rows between a passenger allergic to dogs and/or cats and a passenger travelling with the animal in the cabin. If they are seated 5 rows or fewer from each other, the passenger travelling with the animal in the cabin must change seats to comply with the rule. The animal must be at least 12 weeks old and fully weaned. The animal must remain in its cage, tucked under the seat in front of the passenger, for the full duration of the flight. The passenger must arrive with the animal at least 90 minutes before the scheduled flight departure time. Animals appearing aggressive, undisciplined, ill or in distress may be refused travel. This decision is at the discretion of the Air Transat staff at the airport. Passengers must place the animal carrier under the seat in front of them. As a result, the dimensions of the cage cannot exceed 21.5 x 40 x 45 cm (8.5 x 16 x 17.5 in). The carrier must be leak-proof, well ventilated and soft-sided. A hard-sided carrier or any other type of bag is not permitted. The pet carrier must be big enough to allow the animal to stand, turn or lie down safely and comfortably. No part of the animal may extend outside of the carrier during the flight. The animal may be denied for transport if the carrier is too small. Rates and charges shown apply only to the transport of pets in cabin. Service animals on duty in the passenger cabin fly free. At airports outside of Canada, actual amounts may vary and will be charged in the currency used in the departure airport. To and from Europe: CAD $90 each way per animal. To and from South/U.S. : CAD $50 each way per animal. It’s worth noting that a reservation can be cancelled and refunded up to 30 days prior to the flight date and modified up to 3 days before the flight. Beyond that, the price is non-refundable. We suggest owners put a familiar object in the cage to reassure the animal during the flight, such as a blanket or a toy. IATA regulation states that it is not recommended to have older animals travel by air due to stress-related effects. Air Transat will not be responsible for problems due to stress-related effects on older animals. (Consult your veterinarian). Agriculture Canada and IATA do not recommend giving tranquillizers to travelling animals. If you're thinking about doing so, please consult your veterinarian. For animals travelling in the checked baggage hold, do not provide food or water inside the cage as it may spill and cause your animal discomfort during flight. This service can be booked up to 3 days prior to departure.